Various other murals pay tribute to the 10th and 16th Irish divisions alongside the 36th division (see, e.g., We Are The Dead Brothers In Arms | Killed Wounded Missing | Their Only Colour Was Khaki) but this tarp outside the Whiteabbey British Legion (Fb) shows instead the eight regiments raised in Ireland, whose battalions served not only these three but many other divisions: Royal Irish Rifles, Royal Inniskilling Fusiliers, Royal Irish Fusiliers, Connaught Rangers, Leinster Regiment, Royal Dublin Fusiliers, Royal Irish Fusiliers [should be Royal Irish Regiment], Royal Munster Fusiliers. 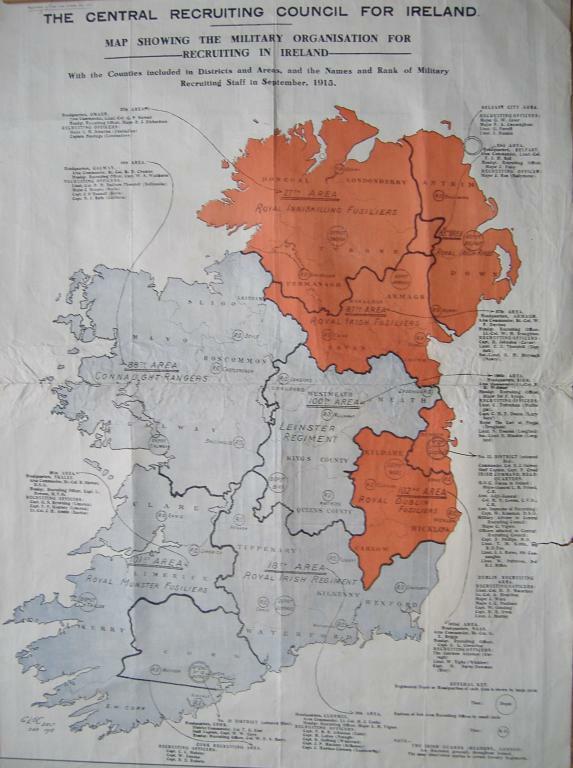 The geographical distribution of the regiments (royal-irish.com has a map of the recruiting districts in Ireland; for battalions, divisions served, and regimental headquarters, see WP.) The background image is of the 36th in their trenches at the Battle Of The Somme.